Indigospirit Bookstore, Mt. Sinai Hospital, 600 University Ave, Toronto. Verity Women’s Club, 111 Queen Street East, Toronto. Susan Sommers started to jog/walk at 58, when she joined the YMCA Fitness Centre in Toronto. Then, in 2005 and 2007 (at 61 and 63), Susan completed two full Marathons (42 kilometres), walking for 7 1/2 hours in each race. Since 2003, she has completed 31 races, from 5K to 42K. ln this inspirational Keynote Presentation, Susan tells her story and describes the obstacles and successes she encountered while fulfilling her dreams. She also shares insights from the two health, fitness, and nutrition books she co-authored: Power Source for Women: Proven Fitness Strategies, Tools, and Success Stories for Women 45+ (BPS books, 2010) and Love Your Body…Embrace Your Life! (Hay House Publishing/Balboa Press, 2016). Mt. Pleasant Library, 599 Mt. Pleasant Road, Toronto. In this motivational Keynote, Susan highlights 10 health and nutrition tools to inspire women to “open your mind, strengthen your body, and lift your spirit”. Topics include ways to embrace self-compassion and self-care; build your own supportive community; develop mindful nutrition to nourish and fuel your body; commit to meditation, breathing, and yoga techniques; incorporate fitness and meditation into your own customized Weekly Action Plan; overcome obstacles; recognize and celebrate your achievements; and focus on inner development, endurance, and continuous growth. 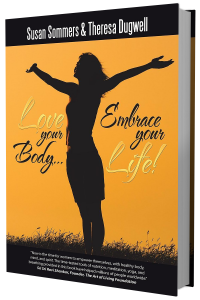 The Keynote is based on the strategies and tools in Susan’s new book, Love Your Body…Embrace Your Life! (Hay House Publishing/Balboa Press, July, 2016). Lole Yorkville, 88 Yorkville Avenue, Toronto. From the moment you arrive at the spectacular Art of Living Retreat Centre in the beautiful Maurice region of Quebec, you’ll feel at peace as the calm and quiet of 250 wooded acres envelop you. Each day, feel pampered with a variety of world-class Ayurvedic spa treatments that eliminate toxins and invigorate your body. Each day, Join Susan Sommers for fitness and health workshops, based on her book, Love Your Body…Embrace Your Life! Enjoy Ayurveda cooking classes and delicious, locally-grown food from the organic garden. The vegetarian cookery demonstrations introduce ways to balance your diet in an easy, creative and delicious way. Spend time taking leisurely strolls or invigorating hikes, relax or boat at the lake, or just find a private space to read a good book. Discover new breathing, meditation and Yoga techniques and processes to relax and continue your inner journey after you leave. Return home feeling a deep sense of balance, inner peace and vibrant health. For more information, contact Debbie Ross, Womens Travel Network, 905 771-8338. © Power Source For Women All rights reserved.